Unique team identifiers – Colored beads, wristbands, etc. Colored Pin Challenge: colored pins are mixed in with regular pins for extra point opportunities. The 2 games is 20 throws of the bowling ball. 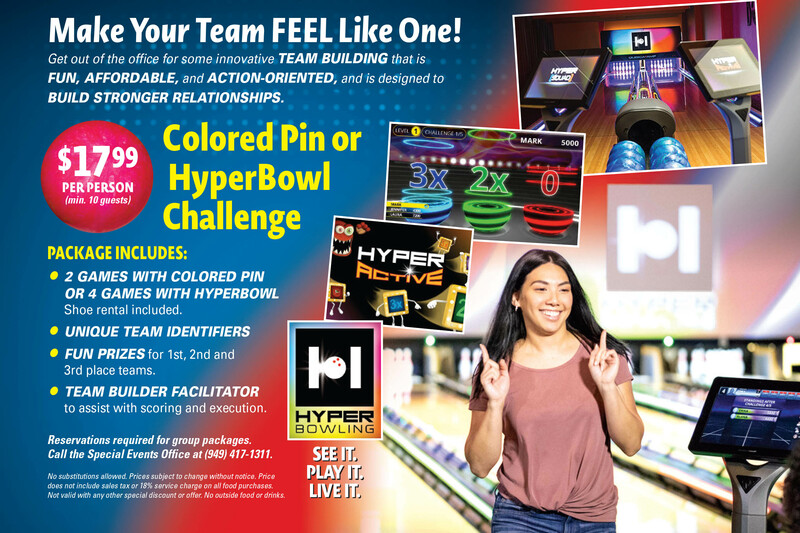 HyperBowl Challenge: HyperBowling combines the fun of bowling with a video game-like play to create an action-packed and fun new way to bowl where there are no more gutter balls. No fancy approach, no perfect curve ball, just hit the colorful targets and level up. Additional catering options available upon request. Meeting Room space available for additional fee (see Room Rental tab on website for pricing). Reservations Required. A non-refundable deposit is due within 3 days of booking to hold reservation. HyperBowling is subject to availability. 2019 © Irvine Lanes. All Rights Reserved.